I’d say that I’m somewhat of an emotional or impulse shopper to a degree. 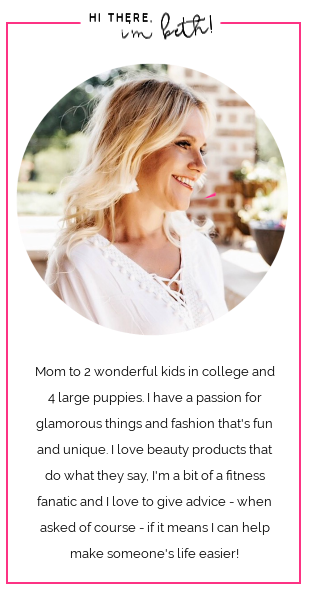 There are certain things that will catch my eye or stop me in my tracks as I’m perusing the aisles – and anything that’s hot pink is one of those things. It just makes me happy! Whether it’s a sweater, a scarf, a pair of shoes or even a hot pink chair, if I see it I will want it! Which is how I ended up with these shoes (the one’s pictured are sold out but these are similar and just as gorgeous!) and this clutch! Actually the original pair of these shoes that I saw while shopping with my big sister was THE ONLY pair left and technically she found them first – which is usually the case when we shop together. And I have to say I was a bit sad when we left the store and those beautiful pink slippers were in her shopping bag and not mine. I let it go and didn’t really think much else about them until she started getting ALL KINDS OF COMPLIMENTS on them! At the hair salon, at dinner…that did it. I had to have a pair of my own! I went back to see if I could find another pair – maybe someone tried them on and put them back on the wrong shelf, maybe I overlooked an aisle, maybe I could find a pair in a size up or down that I could “make work”. No luck…at the store. BUT since this thing called the internet exists now I was able to snag a pair online!!! Success! Which brings us to this clutch. 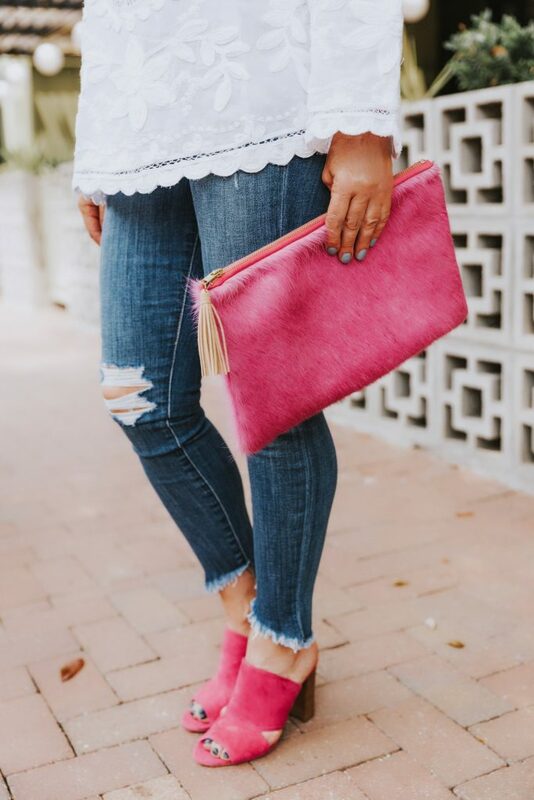 One of my favorite blogs Chronicles of Frivolity that I follow posted about a local company – Parker and Hyde – that makes these beautiful clutches (among other fabulous products) and they make this one in…you guessed it, hot pink! Done! 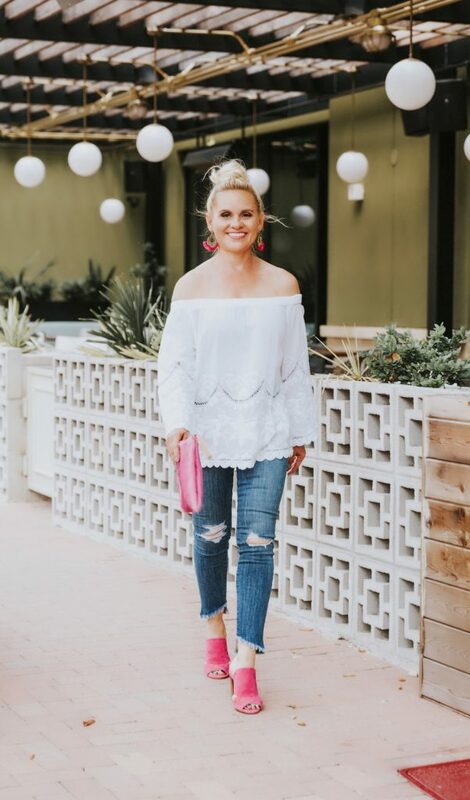 I think I mentioned in a previous post that I love to wear an outfit or accessory that starts a style conversation or creates interest, and a bold color like hot pink will definitely do that! And when it has great detail, pattern or a texture even better. Now if I were to don a pair of hot pink leather pants and a hot pink cropped sweater that may be a bit of overkill – unless you’re a pop star or fashion icon and can pull that off – both of which I am not. So as an accent or accessory is usually a good choice. 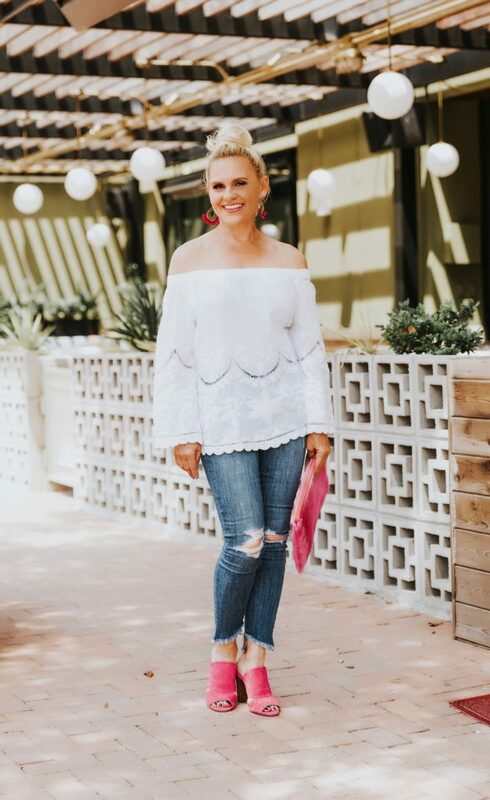 I like to wear bright color with a neutral like white or black and I also love it paired with a classic navy blue or denim. 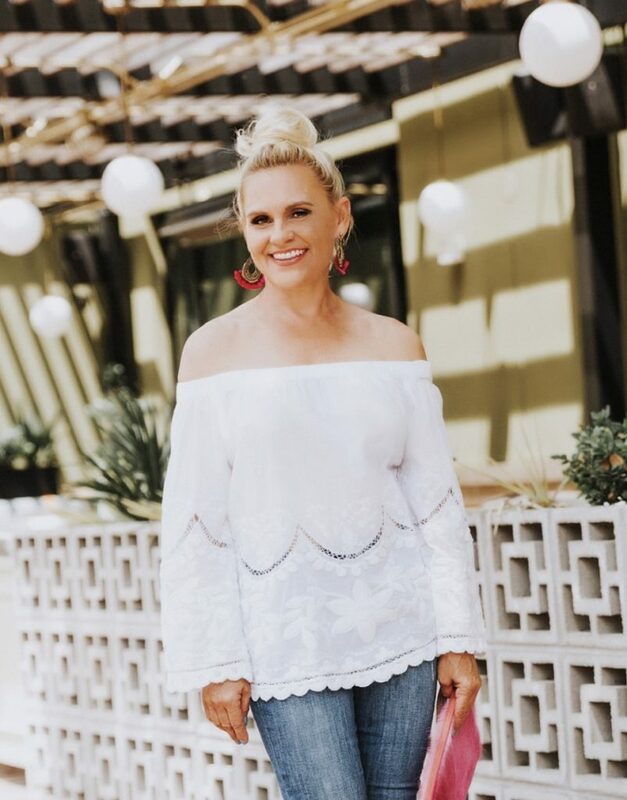 Sometimes a bright color is just like the smile in your outfit and sometimes it even puts a smile on your face! So throw on your favorite bold color and a smile! « Maxi Romper – Who Knew Such a Thing Existed?